Well. . . here’s yet another birth story. I just want to say that I’m so grateful for the Hypnobabies home study course. I live in a fairly remote area of rural New Zealand. Our local hospital has a maternity ward, but facilities are basic. There is no resident OB, though they do come up here to do clinics. None of the following are available: c-sec, epidural, pitocin induction, assisted deliveries (ventouse and forceps). This means that natural and unmedicated birth is pretty common in these parts! The little maternity ward caters for water birth and allows Dad, Mum and baby to room in together after the birth. Home births are pretty popular here, too. It’s a 2 and a half hour drive to the hospital in the city. That’s where you probably give birth if you are “high risk.” In an emergency situation, they fly you from the local hospital to the city hospital in a helicopter. I believe that the majority of births in New Zealand are now attended by midwives. Usually a woman chooses one midwife and stays with her for all the prenatal visits, the birth, and about 4-6 weeks of post-natal care. This care is all free and government funded. I think we are very lucky. I woke up a bit after 7.30am on the 7th of July. I’d been woken by a couple of strong pressure waves and had had the urge to change position and vocalise. . . but resisted the temptation in order not to disturb my husband and 2-year-old son who were sleeping on either side of me. I was 39 weeks + and had only had low-key Braxton Hicks waves so far. Perhaps this would be our baby’s birthday? I decided to get up, get organised and see if the pressure waves would vanish or establish a pattern. By 7.50am I’d had about four more pressure waves. Due to lack of inclination, not having a stop watch, and my increasing sense of urgency regarding my preparations to get ready to leave the house, I didn’t count or time these waves. But I didn’t need a stopwatch to feel their intensity or to know that each wave was lasting a long time. I was surprised to feel some nausea, and a hot-and-cold trembly feeling when one wave caught me half-way across the kitchen with a jar of milk in my hands. I heard myself singing with the power of these waves (sounds quite lovely when I write about it. . . but probably sounded like one of our cows was stuck in a fence!). In my mind I heard some of my favourite hypnobabies affirmations – especially the one about how every powerful birthing wave was bringing our baby closer to being in my arms – and felt myself lighting up with so much love and anticipation: “Yes! This is our baby’s birthday.” I felt sure of it now, even though I’d only had a handful of pressure waves. 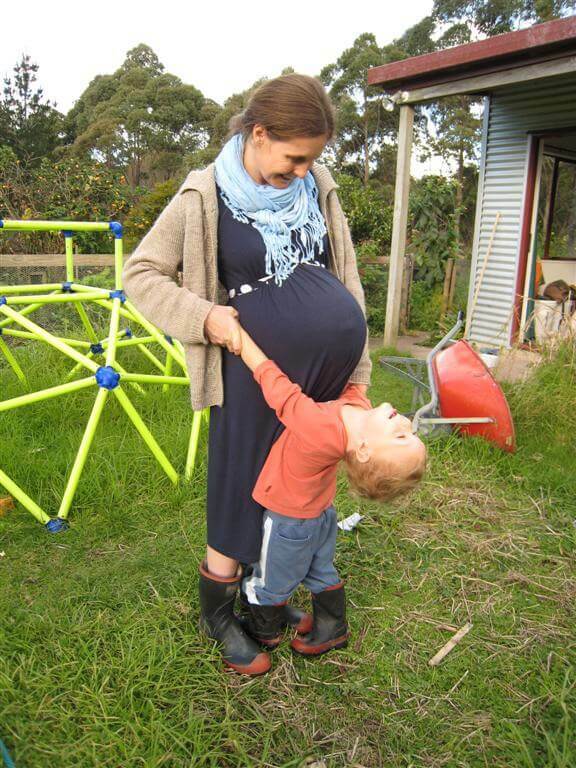 Time to wake my husband Kevin and call Tania (our midwife). After another pressure wave, I gave up on the idea of making a quick breakfast, but drank a glass of water in hopes of staying hydrated for the birth. As I woke my husband (who works nights and was not exactly easy to rouse after only 3 hours of sleep) and son (who was in a grumpy and toxic state due to being not quite recovered from a bad case of the flu), and tried to prepare to leave, it began to seem to me that this baby would perhaps not wait to be born at the city hospital. After what seemed like a very long and trembly pressure wave, I went to the bathroom to vomit up the glass of water I’d drunk. I asked my husband to call my parents and ask them to meet us at the maternity annex as soon as possible to care for our son. Finally we were in the car driving the 20 minutes to town. I had hoped to listen to Hypnobabies affirmations on the MP3 player on the way to town, but our son was throwing a full-scale tantrum and needed my attention. It’s not very nice to be a 2 and a half year old, not quite recovered from the flu and getting shovelled into your car seat in a big hurry one morning without having breakfast. I tried to comfort him between pressure waves. Once we had coverage for the cell phone, my husband dialled my parents’ number and handed the phone to me. “Is Mum on her way to town?” I asked my Dad. We decided that Tania should give me an internal exam (the only one I ever had during this pregnancy and birth), so that we could make a fully informed decision about whether or not to try to drive to the city. It turned out that I was a “very stretchy 8cm” with a bulging bag of waters coming right down the birth canal. Tania assured me that this baby was coming soon. The waters looked on the point of bursting, and were the only thing holding back the baby. The last 2cm of cervix will be gone as soon as the membranes release, she told me, and the baby is well down into your pelvis and in a good position. No question of going to the city. Water birth was out, too, unfortunately, since there would not be enough time to fill the tub. I was still up on the bed from the examination and didn’t want to move. I got onto my hands and knees and made powerful wild animal noises through the pressure waves. I was using the Hypnobabies “open open” and “peace” cues, though I don’t think I sounded very peaceful! I felt elated and powerful to know that our baby was so close to being born. My husband was still outside with our son, and I really didn’t want the baby to be born without him. I tried knees to chest position for a few waves. Still pretty intense, but it toned down the grunty pushy feelings that I’d been having and made me feel more grounded. At last Kevin arrived and I leaned my head against him and asked him to rub my lower back during pressure waves. He put his hand on my shoulder and told me to “relax” as well. I was so happy and relieved that he was with me. After a few waves with Kevin and Leeann there, I realised that there was no need to hold back any longer. I knelt up a bit and let my body respond to that grunty feeling of fullness. The waters burst and gushed everywhere and I felt a huge sense of relief. It was 9:10am. On the next wave, I felt the baby’s head come down and found myself tuning into various Hypnobabies cues about breathing him down and out “aaahh” and relaxing my face, arms and hands. I felt so well prepared and so much in control as I pushed our baby out, even though I think I probably sounded more feral than ever! I felt Tania putting oil on my perineum. It was warm and it felt so wonderful and comforting. After a few more waves I felt the most intense stretching. I said something like, “I’m stretching! I’m stretching so much!” “You’re doing great,” Tania encouraged me. “This is where it helps just to breathe gently and let yourself stretch before the baby’s head comes out.” I panted gently for a bit until I felt the stretching sensation subside. Then I pushed out our baby’s head. I couldn’t believe how easy and good that felt! Next thing I knew, Tania was saying “Ok, we need to flip for the shoulders.” This really took me by surprise, since everything had gone so smoothly up until now. I was on my hands and knees. Tania and Leeann helped me over onto my back and flexed up my knees by my sides (McRoberts manoeuvre). I heard Tania say, “That’s got him. He’s turning. . . Here he is!” I felt our baby’s shoulders come out, and then the whole slippery length of his body. And then he was on my chest, warm and sticky and perfect! Reed Brian F. was born at 9.33am on 7th of July, 23 inches long and weighing 7lb 13oz. Wow! That’s nearly 3 quarters of a pound lighter than his older brother’s birth weight of 8lb 8oz even though he’s a whole inch longer! He has long skinny arms and legs, broad shoulders and massive feet and hands. And his parents and big brother think he’s just gorgeous!! Within 5 minutes he was helping himself to his first feed. The physiological 3rd stage happened just as I had visualised it. I felt great afterwards– the birth was smooth and practically bloodless. I didn’t have even so much as the tiniest scratch and swelling was almost nil. And who cares about “sticky shoulders” when they come unstuck so calmly and easily! We went home a few hours after Reed was born. Hypnobabies was such an important part of this birth, even though I didn’t use the techniques and tracks the way I thought I would during the birth! I’d always expected and visualised a much slower and more mellow first stage and was really very surprised to have a baby in my arms just 2 hours after waking up in the morning. I didn’t end up listening to any tracks during the birth, and didn’t use the light switch at all. First, because I didn’t seem to have time. Second, because I didn’t actually feel the need. 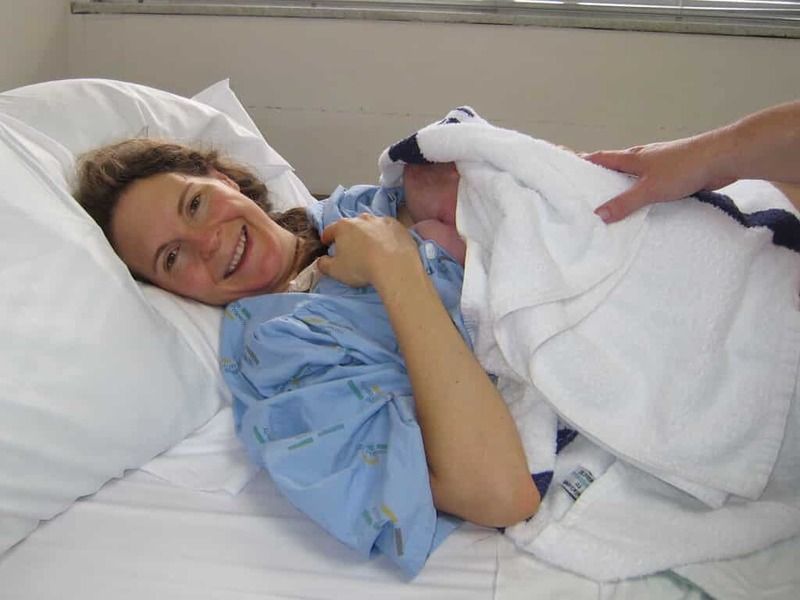 This birth was a wild and intense experience, but I felt so strong and positive throughout – never for a moment did I think that I couldn’t cope or didn’t want to be doing this. I was really glad I listened to the birth guide CDs a few times in the week before the birth, because lots of the suggestions off those tracks came back to me right when I needed them. I felt as if I had a customised birth guide CD playing inside my head! Post-hypnotic suggestion is a wonderful thing!! I fully believe that Hypnobabies helped to “programme” me for a positive and awesome birth experience. Congratulations, Rebecca! You are a mighty woman! Your birthing was indeed short and powerful, so thank goodness that you chose Hypnobabies and had your “hypno-tools” on board. Yes, post-hypnotic suggestion is a wonderful thing and you practiced well! All the best to you and your beautiful family. Great job, Hypno-Momma!